Waglands is quite unique. We sit atop a hill overlooking the Hutt Valley, nestled a stone throw from the gem that is the Belmont Regional Park. We are regenerating more than half of our land from poor quality farmland back into native bush, which has just been dubbed a “Significant Natural Area” by the Hutt City Council. In our winning entry to Wellington Region Business Excellence Awards, we mentioned our rodent program, initially intended to safeguard our guests (and their food supply) from the incessant invasion of mice and rats. Starting off seven years ago with patchy DIY, we finally called Wellington Pest Management to do it much more thoroughly than we ever could. And that was when the magic started slowly happening. A year on, no more rats have taken residence in our roof space. Our resident quail and mallard families survive to maturity, rather than whittling down from six to (usually) nothing as we have often wondered about. Tuis are busily diving between mature flowering, natives, and a sudden upswing in little native skinks furtively scurrying around. 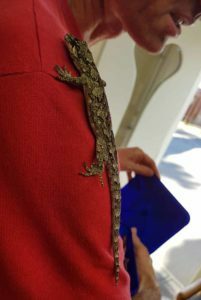 But the most exquisite resident to recover is the native Ngahere Gecko, quite to the utter delight of our kids, and to the surprise of other locals who have never seen one in 40years of living up here. Their camouflage is no doubt hiding a flourishing population that we can increasingly celebrate. In the incessant intensity of work, family and life, it is so important to stop and smell the roses, and inhale deeply from our surroundings. We all share a truly amazing place to live, and Arlene and I are so privileged to be able to share ours with our furry guests, our equally precious team of wonderful and dedicated people. And quietly going about their thing in the background, unobtrusively sharing their place with us, is our precious native taonga.